Is SiteGround Good For Ecommerce Hosting? SiteGround was founded in Bulgaria, Sofia. At first, it started as a small local web hosting company within Bulgaria. Over time, they have expanded their wings and now they are well-known all over the world for their awesome service. They have all types of web hosting plans. You have the option to choose normal shared hosting or even higher-end hosting like dedicated or enterprise hosting plans. Anybody will find their perfect choice with SiteGround. For instance, if you like to start an online shop or an eCommerce site, SiteGround has some special offers for you. You can choose their shared hosting plans which will come with additional eCommerce features. Now, let’s get to know if they are good for your eCommerce websites or not. Why SiteGround is good for eCommerce hosting? 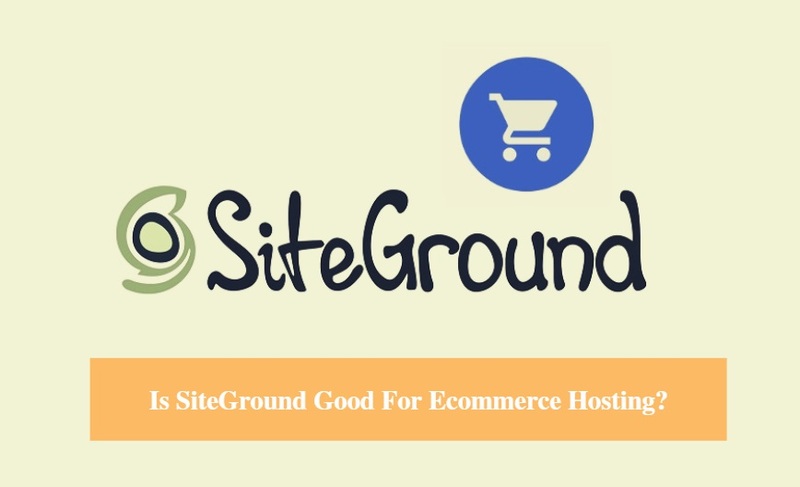 Undoubtedly, SiteGround is one of the best options for hosting your eCommerce website. In this section, we will reveal the reasons behind this. Let’s get started. In the case of eCommerce websites, the shopping cart is one of the most essential parts of your website. There are several shopping carts you can use. With SiteGround, you will find all of these popular shopping cart apps like OpenCart, PrestaShop, Magento etc. for free. You can choose your favorite shopping cart to install from within your cPanel without any problems. In some instances, SiteGround actually automatically installs some of the most popular shopping carts within every eCommerce web hosting accounts. So, you might not even have to install it at all. Even if you want to use other shopping carts which is not available on the cPanel of your web hosting account. You can do that too. SiteGround is compatible with most of the eCommerce shopping cart apps. If you want a better experience from your eCommerce website then you should use a combination of some apps and plugins. For instance, you can use WordPress as your CMS (Content Management System) with any popular eCommerce plugins like WP e-commerce. On the other hand, you can also use Joomla CMS along with shopping extensions like Virtuemart. There are a lot of possibilities. If you want to try these options, then you must install the CMSs prior to everything else. And, SiteGround makes it a piece of cake to install any CMS on your website. On your cPanel, you will find an auto-installer called ‘Softaculous’ which can be used to install any CMS effortlessly. Softaculous will launch a setup wizard while you are installing a CMS, and it will tell you everything you need to do install the CMS. The best thing is that you can install a CMS on your website within just a couple of minutes using the Softaculous auto installer. It is perfect for beginners and it will help you save a lot of time. You can also uninstall any CMS with Softaculous as well. You can install more than 18 eCommerce related CMS with SiteGround for free. If you already have a website with an online shop then you are in luck. You don’t have to start over. SiteGround will take care of everything to migrate your previous site with all the contents as it was. However, if you want free site migration, you will need to get the GrowBig or GoGeek web hosting plan. An SSL certificate is a must have when it comes to an online shop. It serves the purpose of securing the network and it also protects all the financial data of your customer. There are a lot of SSL providers. Most of them are paid products. However, SiteGround is offering 3 types of SSL with your eCommerce hosting account. You can choose anyone you want. The SSL they offer are Let’s Encrypt, Premium Wildcard, and Premium SSL. Among them, SiteGround is offering the ‘Let’s Encrypt’ SSL for free with every web hosting accounts. Whereas the Premium Wildcards is $138.46 (3rd Party Price) and the Premium SSL is $959.62 (3rd Party Price). But, with SiteGround you can get these SSL certificates for free for the 1st year. Also, the price will be reduced to $90.00/yr. for the Premium Wildcard SSL and $499.00/yr. 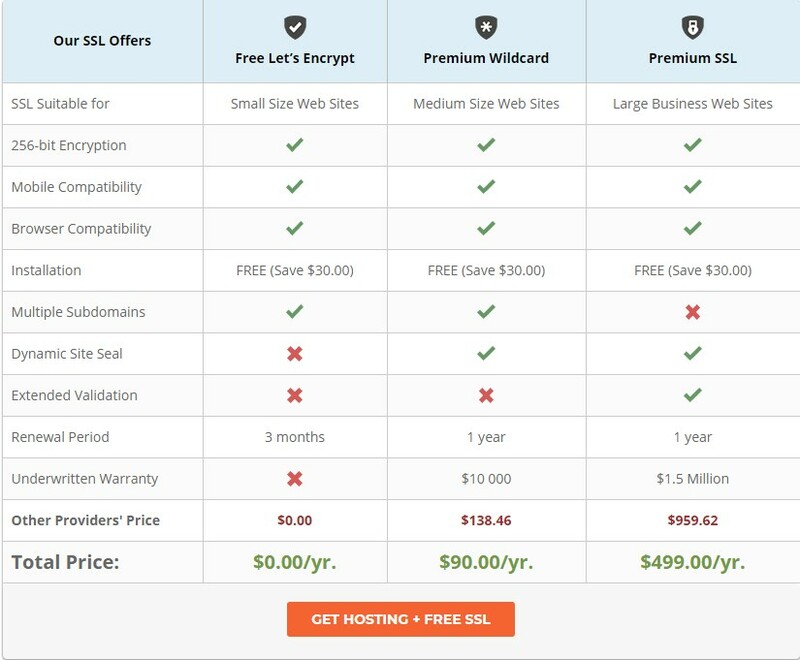 (SiteGround Price) for the Premium SSL (SiteGround Price). You can see that you have a lot of options when you go with SiteGround. SiteGround security team writes custom rules for their firewall every week. That way, you can be sure that your websites won’t be hacked if you host your site with SiteGround. SiteGround has 3 level security on their servers. They protect their servers, customers’ accounts and the websites of their customers as well. They have set up a proactive monitoring system on their servers. It can detect any type of vulnerabilities within seconds and it can also fix the issues itself. We can say that SiteGround is one of the best while it comes to web hosting security. SiteGround also keeps its software and hardware on their servers regularly updates. It is very important to update your CMS when a new version comes out. 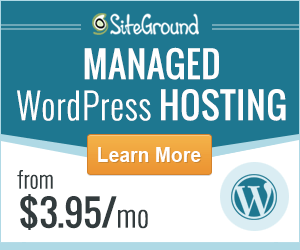 And, SiteGround does it automatically on every web hosting account of their customers. Even if you get a shared hosting account form SiteGround, your account will be isolated from every other account. This technology is invented by SiteGround. It keeps you safe even if another account get hacked on your shared server. If you are running a large eCommerce site, then you should have PCI compliant servers. It is a security measure taken to secure transactions on the web. There are 12 requirements a website should follow to keep all of their customers’ information safeguarded. Luckily, SiteGround offers PCI compliant servers with their GoGeek plan for free. Another important aspect of a perfect web hosting company would be to have a professional and helpful customer care team. SiteGround actually has a well-trained customer support team. They are available 24/7/365. You can get in touch with them via email, phone, tickets, and live chat etc. They are very helpful. We can attest to that. Because we are using their web hosting service to host our site (ReviewPlan.com) and they have helped us anytime we reached them. They are offering a lot of features totally free. Some of them are very crucial and other companies charges for these type of features. For instance, they are offering free SSD storage to all of their web hosting customers. 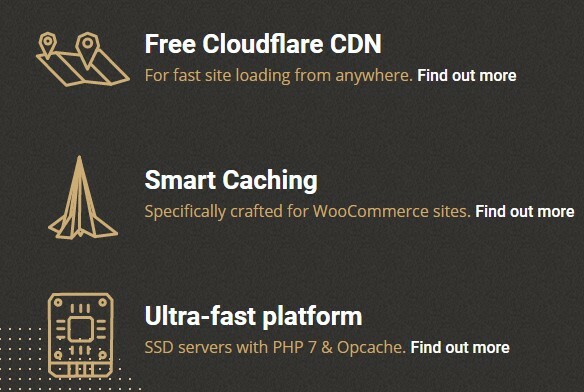 You are also getting free Cloudflare CDN service which can be very beneficial when it comes to servicing your visitors with a faster website. On top of all these, they are also offering free daily backups. They will automatically backup your site’s data daily and they will make 30 copies of the data and store them in their secure servers. So that if you lose any data, you can easily restore them. Website uptime is very important if you want to have an online shop. If your online shop goes down frequently, you could lose a lot of sales in a matter of minutes. Thus you should choose a web hosting company which is already famous for their great uptime performance. Fortunately for you, SiteGround is one of the best when it comes to uptime. As we are using SiteGround on our website, we have been checking their uptime record daily. In the image above, you can see the result of our website’s uptime performance. 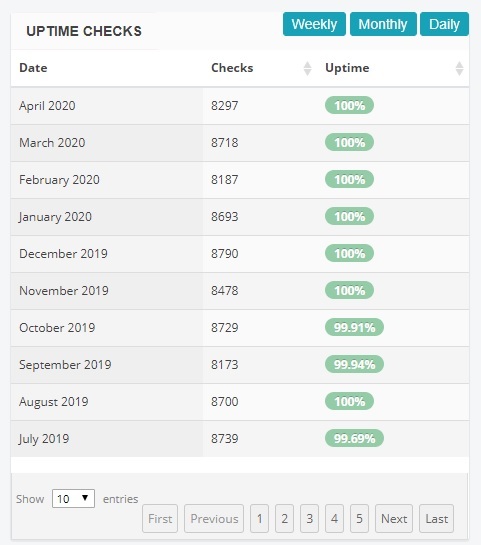 It is clear that SiteGround has kept 99%+ uptime on all of the months. It is really incredible! 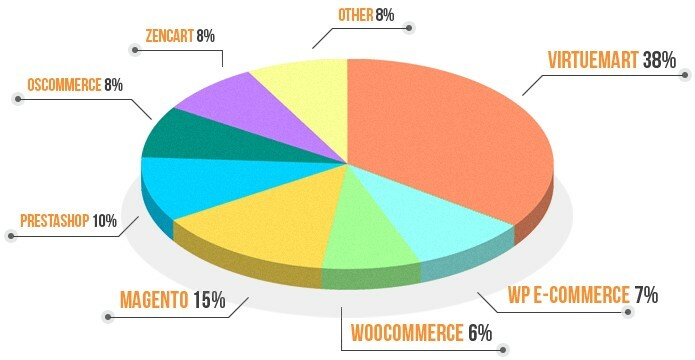 So, if you want more sales, you should choose SiteGround as your hosting provider for your eCommerce sites. For eCommerce hosting, you should get a web hosting which is secure, fast, has got high uptime and has a friendly customer support team. A lot of web hosting companies will tell you that they offer all of these. But, most of the time, it is a false claim. We have searched for a long time for a perfect web hosting and all the time, we come back to SiteGround. So, for our readers who are thinking about hosting an eCommerce website, you can go with SiteGround without any problem.